It seemed almost storybook like with the thousands of attendees chanting his name at the Auditorium Theatre. With a full house of 3,985 an overpowering feeling took rally goers by control saying they “Feel the Bern” would be an understatement. The last time Bernie Sanders was in Chicago before this week’s rally he was singing “This Land is Your Land.” With the Illinois primary results in many Illinois residents believed The Land of Lincoln was the land for Sanders this primary election. 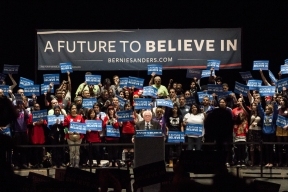 Attending Sanders’ “A Future to Believe In”, the atmosphere was still buzzing with the “Bern” feeling being just one week removed from the heavily protested and canceled Trump rally at the UIC Pavilion. Lining up since 3 p.m., voters with a mostly young turnout were hopeful on what would have been Sanders’ biggest upset to date, defeating Clinton at her home state. With an almost rock star welcome Sanders didn’t disappoint his rally goers. 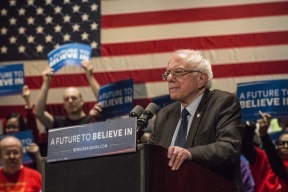 Projecting to lose by a huge margin Sanders continued his efforts until the very last minute. Bringing in 49 percent of the vote, Sanders’ close finish to Clinton’s well established home state ties speaks volumes. Sanders did very well in the southern part of Illinois but couldn’t secure the Chicago vote despite his numerous visits and well attended turn outs. What makes Sanders stand out to his voters is his continuing message of a fair and balanced government. A message that he has been advocating since the beginning of his political career which strikes a chord with voters. As a person of color in one of the most segregated cities in the country it was hard not to agree with Sander. He didn’t say anything new but addressed first the Chicago crime rate, Mayor Rahm Emanuel’s many blunders, and his concerns for the closing Chicago Public Schools. His message was old with familiar sound bites you’ve heard during democratic debates or coverage of Sanders. Although it’s at times predictable to what Sanders next remarks would be his core almost scripted messages resonates to votes as honest and caring. 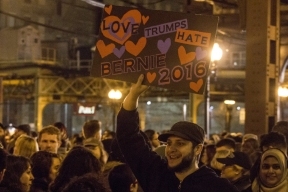 After the Illinois primary many young first time voters are now asking themselves how this could have happened. To them Sanders was the salvation for a brighter future. In an almost learning experience Sander’s lost teaches them more than a win could in the humbling Illinois democratic process.